Pinewood nematode [Bursaphelenchus xylophilus (Steiner & Buhrer, 1934)] is considered a significant threat to European forests. Functional monitoring of its vector, the longhorn beetle Monochamus galloprovincialis (Olivier, 1795), represents an efficient method of pinewood nematode detection and needs to be adopted across European countries. 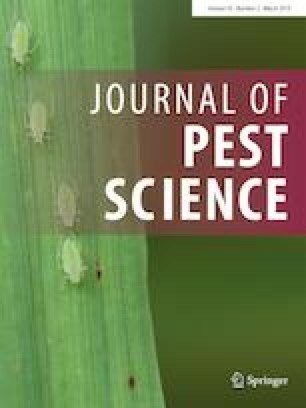 Hence, the effectiveness of M. galloprovincialis trapping under different attractants and trap heights above the ground was investigated at four forest study sites in the Czech Republic in 2015–2016. Additionally, the effects of the calendar week and meteorological variables were assessed. In total, 24 Teflon-coated cross-vane traps (Crosstrap® traps) captured 1524 M. galloprovincialis individuals and 36,896 nontarget insects. Traps placed in the canopy (18–24 m above the ground) captured sevenfold more M. galloprovincialis individuals than those installed 2 m above the ground, and the Spanish attractant Galloprotect Pack® resulted in three times more catches than the Austrian attractant Gallopro Pinowit®. The highest maximum daily temperature during trap exposure was also an important factor, with most catches occurring above 27 °C. The results showed that Teflon-coated cross-vane traps with Galloprotect Pack® attractant are efficient tools for M. galloprovincialis monitoring in Central European forests when installed in the tree canopy. Additionally, we suggest using traps with larger sieve mesh sizes at the bottom to enable the escape of small nontarget taxa. During the 2-year study, the pinewood nematode was not found. However, 38 specimens of M. galloprovincialis were shown to be vectors of Bursaphelenchus mucronatus (Mamiya & Enda, 1979) dauers. This study was supported by the Internal Grant Agency of Faculty of Forestry and Wood Technology, Mendel University in Brno, Reg. No. LDF_PSV_2016004, and by the European Social Fund and the state budget of the Czech Republic, Project Indicators of Tree Vitality Reg. No. CZ.1.07/2.3.00/20.0265. We thank Tomáš Kudláček, Department for Forest Protection and Wildlife Management, Mendel University in Brno, for help with statistical analyses; Anna Havlíčková, Marek Brátka and Kateřina Mikušková for technical help in taking samples from the traps; and Kateřina Tománková and Hana Orságová, Central Institute for Supervising and Testing of Agriculture, for help with molecular identification of the extracted nematodes. This study was funded by the following projects: Reg. No. LDF_PSV_2016004 and CZ.1.07/2.3.00/20.0265.